Eating Your Words: 2010 Edition! Do your waffles whisper to you? Or does the arugula like to argue? A great dish can speak for itself, so why not let it do all the talking! If these entries have you feeling inspired (if not hungry!) then head into the kitchen and let your food do the talking. To enter, use fruits, vegetables, noodles, milk coffee or just about any food and beverage to spell out a message, then take a photo, write a post and e-mail us about it. This year, we will choose at least one winner whose creative foodstuff speaks loud and clear to us! As for the prize, there is the awe and admiration of an adoring public . . . but we do have something else in the works. For now, we're going to keep you in a state of suspense, so stay tuned for the prize announcement! 1. 'Write, spell or draw' using food or drink, and create a blog post about it from now (the date of this post) until midnight on Wednesday, March 31st. We will accept any previous blog posts you may already have where you've created a 'written'-inspired dish or drink. 2. Blog about your creation, including photos, and add a link back to Savor the Thyme (http://savorthethyme.blogspot.com) and Tangled Noodle (http://tanglednoodle.blogspot.com). If you'd like, feel free to grab the badge below and place it in your post! You can still participate even if you don't have a blog at all. Simply e-mail the above information minus the blog details and we'll include it in the round up. 4. Please keep it clean! Appropriate humor is always welcome. All entries will be posted on both blogs in the first week of April. To get us started, here's a little something I baked up today: Piped Butter Cookies! The recipe comes from the blog A Baker's Videoblog and yields crispy, buttery delights. There's a video tutorial showing how to pipe out the cookie dough - simple enough, unless you happen to be missing the appropriate-sized piping tip, like me. I'll spare you the expletive-laden details and just say that I managed well enough. I will definitely try to participate! What a cute idea! Adorable! Want to give this a try. Hmm ,.. What to make?? Cool! I will so need my daughter's help again :) Luckily she's more creative than ever. Ok, I'm definitely doing it this year. I meant to last year, but I'm terrible at remembering to do these things. I'm going to write myself a note and stick it to my moniter. Heh. These are adorable! They looks too delicious to eat! I can't wait to see what this year's challenge brings. This is both creative and delicious at the same time! Maybe if I have the time I'll try and join in... I'd have to rack my brains first and squeeze my creative juices out! This is a really cool idea...and I love your version of eating your words! If not, I'll just be excited to see the participants' creative ideas... can't wait! BTW thanks for all the support... truly appreciate it...♥♥♥... happy sunday! What fun! This is all new to me but I love it! And those piped cookies look great--perfect for dipping in coffee or tea, yes? My mind's racing with ideas...thanks for the fun inspiration. oh wow this is so cool!! Wow! Thank you all for your enthusiasm about EYWII! Sarah - I hope you will! Would love to have one of your beautiful photographs gracing our blogs! Mardi - Please do! Last year's entries ranged from a single letter to a full blown video! Jennifer - This is going to be a great event . . .! Unplanned Cooking - Thank you and yes, please do! Bring in the little ones to help - it's a fun event for all ages (and foods)! Manggy - I actually have a spritz-thingy (I mean, 'cookie press') but had to pipe out my letters. Sorry to keep everyone in suspense but we're working on the prize - last year, we felt badly about not having one to offer. 5 Star Foodie - Yay! Your 'message in a cocoa' last year was so sweet. Can't wait to see what the 5 Star mother-daughter duo will come up with! Bob - Excellent! We'd love to see a creation from you. Jenn - I have no doubt you'll come up with something incredibly creative! Trissa - Me, too! Last year's entries were great - almost too good to eat. As for these cookies, the butter cookie alphabet is steadily being consumed by the husband . . .
Trisha - Rack and squeeze away! We'd love to have you participate. ValleyWriter - Great! Hopefully, we've given everyone enough time to create. We're looking forward to seeing it all! Malou - Happy Sunday! Can't wait to see who wins that gorgeous bunch of calamansi. And no pressure - we'd love to have you join in if it works out! Megan - Thank you! The cookie recipe is fantastic and so incredibly easy, if you don't count how hand-crampingly-tough it was to pipe out the dough with a too-small tip. 8-) But I persevered and they are indeed perfect for dipping! Would love to have you join in the fun of EYWII. Chow and Chatter - It's so fun! Hope you'll consider jumping in! Imagine finding this much fun on my first visit here?!!! I'm a writer and foodie, so I can't wait to write something with food. i need some inspiration... hopefully before closing date! This sounds like a great and fun idea. I just popped over from Mardi's blog reading the post about Hell's Kitchen. It looks like you gals had some great food! Yay! So glad you guys are doing this again, I had so much fun with it last year! Wow, I'm impressed with those piped butter cookies, Noodle. Great idea! Super cute idea! I have to go away and think about this. It wil be fun! What an awesome challenge. Those cookies look delicious. Now I have think about what would be good to make. And I heart the idea of the pipping cookies! I love this idea! Will have to see what I can come up with (happy I didn't miss the deadline). wow, that is a really creative challenge! it's so neat to see food spelled out as words. how fun! we'll have to see if we can come up with something to spell out. Fantastic roundup coming of edible words…the words looks delicious, it seems odd the last sentence, isn’t it? Ha! What an awesome idea! I love it! You can have your words and eat it too!! These cookies are to die for! I would give anything to have a few! I love your play on words! This round-up would be a blast to do! Those cookies look great, thanks for the recipe link! Thank you all for the new comments! I hope you'll consider joining us in the fun! Laurie - Hi and welcome! So glad that you're first visit here was right at the start of this event. Please come back to find out our prize - it's going to be great and we'd love to have you join! Beancounter - I'm hoping! It would be great to have you join in - please check back to find out what our prize is! Lisa - Thank you! The contest was fun last year and I think we'll have another great turnout. As for those darn piping tips, I always talk myself out of buying a kit of different shapes and sizes, even when I have a handy coupon. Grrr . . . this should teach me a lesson. I'm going to get them . . .
Diva - Last year's contest was where I first 'met' you!! 8-D Wish I could take credit for piping the cookies but it was all from AsianBakes - I just wished I had the right-size tips: it was hard squeezing out that dough through the smaller tips! Now, get that tiara going - we've got a great prize to offer! Kat - I hope you'll consider joining! Juliana - Thanks! I must say that it was much easier to eat the cookies than it was to pipe them out. But I'm pleased they turned out so well! Penny - Yay! We'd love to see what you come up with. Rachel J - Woohoo! Looking forward to your entry - it'll be a lot of fun! Table Talk - There's still plenty of time, so take your time and have fun. Please come back for our prize announcement soon! Gera - Thank you! And many thanks for supporting this event with your tweets! Teanna - Thanks! Now, I know you could come up with something totally unique for this . . .! Maya - Exactly!! I'm slowly eating through these piped butter cookies, for instance . . . ! Nazarina - Thank you! The cookies are light, crispy and absolutely delicious. Please do come and join us in this event! How fun--I remember seeing this last year. Hopefully I can get it together this year to enter. Your cookies look crisp and delicious! Debinhawaii - I do hope you'll enter! Have you seen the prize announcement? It's an aebleskiver pan and we will ship anywhere! As for the cookies, they turned out really well although uneven piping let to some letters being crispier than others. Thank you! This is a neat idea. Can't wait to participate. Although the cookies expanded during baking, they managed to keep their piped shapes. They tasted quite ‘crunchy’ and yet melted in the mouth. They’re buttery and not too sweet. I'd Like to Thank My Peeps . . . 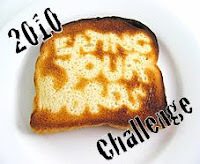 Eating You Words 2010 Challenge: The Judge! Eating You Words 2010 Challenge: The Prize!